If you are a business that generates leads or sales through phone calls, then PPC Call Tracking is essential. With PPC Call Tracking from Kinsey Street Online Marketing, you know exactly which keywords are bringing in the business. 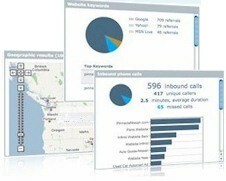 PPC Call Tracking measures and tracks phone calls from your Pay Per Click campaigns and every other advertising source. If the caller calls the phone number on your website, we can tell you the search engine the caller came from, whether the caller clicked on an organic listing or a pay-per-click ad and we can also tell you the exact keyword that brought the caller to your website. If your business relies on the customer calling you on the phone then PPC Call Tracking is essential. Our call tracking service can automatically track and record every phone call coming in to your business. This takes the guesswork out of advertising since it allows you to know which advertising campaigns drive phone calls and which campaigns do not. This allows you to put more budget into the ads that are working and eliminate the ones that are not, driving increased ROI. How will PPC Call Tracking benefit my business? PPC Call tracking can be a stand-alone service or used in conjunction with our other online marketing services. If you also use Kinsey Street for your PPC Campaign Management, we use the data from the PPC Call Tracking to then improve your search marketing ROI and produce more quality leads for your business. How does PPC Call Tracking work? By assigning a unique phone number (local or toll-free) to each advertising campaign, your business will be able to track all of your phone calls back to the campaign that generated the phone call. This will allow you to see exactly which advertising campaigns are generating sales and revenue for your business. For instance, you could have separate tracking numbers for PPC, Yellow Pages, Radio Spots or newspaper ads. At Kinsey Street, there is no confusing pricing. You pay for what you use, with recording, chat, and virtual receptionist features included as a value-add. No contracts, no minimums and no bundling of minutes that you don’t use. Just simple flat fees for lines and minutes at a price that is surprising affordable. Generate deeper insights into your search marketing campaigns with PPC Call Tracking and reporting from Kinsey Street Online Marketing. Contact us today to get started.